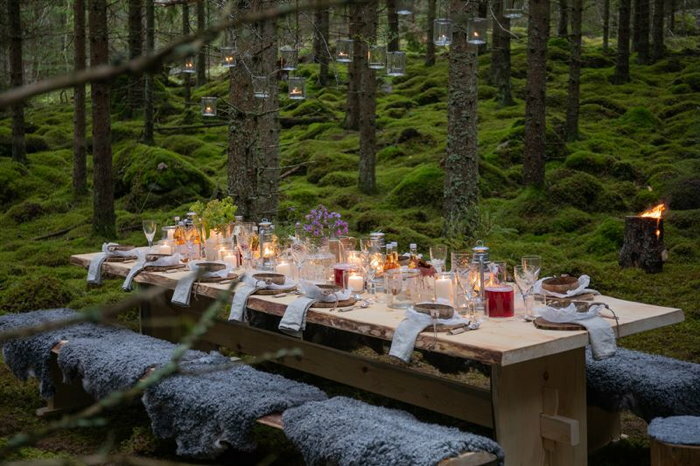 To highlight healthy and natural food available in nature, Sweden, together with four Swedish Michelin-starred chefs, is launching The Edible Country - a 100-million-acre-DIY gourmet restaurant. The restaurant, with a menu created from ingredients found in Swedish nature, is free of charge and open for reservations. In this new global initiative, Sweden is showing the world how easy and accessible healthy food can be. The Edible Country consists of a nine-course menu that visitors can prepare and cook themselves - in the wild. It is co-created by Swedish Michelin-starred chefs Titti Qvarnström, Niklas Ekstedt, Jacob Holmström and Anton Bjuhr. As part of the initiative, seven handmade wooden tables have been placed across the country with ready-to-use kitchen kits and cooking tools. The tables are bookable between May and September through visitsweden.com/ediblecountry or bookatable.co.uk/theediblecountry. And if they are fully booked, it is still possible to visit The Edible Country and prepare the dishes at any other preferred location in Swedish nature. "For me, Swedish nature has always been my biggest source of inspiration when cooking. The hours I have spent in the forest have turned into the realization that cooking outdoors, with the ingredients right in front of me, is the core of Swedish cuisine. The Edible Country is a symbol of how easy, close and uncomplicated food can and should be," says Niklas Ekstedt. "At Bookatable we help diners find great restaurants to create memorable dining experiences, so we are absolutely delighted to help with this innovative idea. Discovering a new restaurant is always exciting, but getting to forage for food in Sweden's beautiful countryside and then cook a dish created by a Michelin-starred chef is an opportunity not to be missed. My only advice would be to book up quickly!" says Michel Cassius, CEO Bookatable by Michelin.